The bulk of the collection was amassed during the secularisation of churches, convents and oratorios carried out by the French during their occupation (1797-1810). 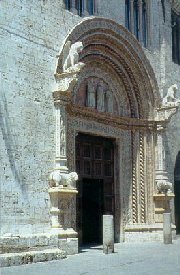 For a time the collection was housed in the former convent of the Olivetani, at Monte Morcino Nuovo, now the seat of the university. The Galleria Nazionale dell' Umbria was founded in 1863 and has occupied the third floor of Palazzo dei Priori since 1879. After a long period of closure to allow for restoration and re-hanging of works, the Galleria was recently re-opened in its entirety. The exhibition layout is organised chronologically and by painting schools. It documents the development of painting in Umbria from the Middle Ages to fairly recent times, and includes several masterpieces of Italian art between the 13th and the 18th centuries. five statues by Arnolfo di Cambio, dated 1281, taken from a demolished public fountain that stood in what is now Piazza della Repubblica, half way along Corso Vannucci. Umbrian School works prior to Giotto (1272 crucifix by an unknown artist named only as Maestro di San Francesco, from San Francesco al Prato; pentiptych dated 1280 by Vigoroso da Siena). 'Madonna with Child' by Duccio di Boninsegna (1305); the Polyptych of Montelabate (1317) by Meo di Guido da Siena; board by Marino da Perugia; glass window by Giovanni di Bonino (1345); statues of the patron saints of Perugia attributed to Ambrogio Maitani; 'Madonna with Child' by Gentile da Fabriano (before 1408); polyptych of Sant'Antonius by Piero della Francesca (1460-70); polyptych by Beato Angelico (from San Domenico, 1437); 'Madonna with Saints' by Benozzo Gozzoli (1456). Cappella dei Priori: the fresco cycle by Benedetto Bonfigli, completed between 1454 and 1480 and represents scenes from the life of the patron saints Ludovicus and Herculanus, with views of the town of Perugia as it was then. Tablets of San Bernardino (1473) by Perugino and others, from San Francesco al Prato; more works by Perugino ('Christ Resurrected in the Sarcophagus', 1495; 'Madonna della Consolazione', after 1496; polyptych of St Augustine, 1500-1523), by Pinturicchio, by Bartolomeo Caporali, Fiorenzo di Lorenzo, Lo Spagna and sculptures by Agostino di Duccio - these came from the facade of Maestà delle Volte (1473), from the main altar of San Lorenzo (1473-74) and from the facade of San Francesco al Prato. The last floor houses more recent paintings as well as a section dedicated to the history of Perugia. Hotel and Restaurant La Rosetta Piazza Italia, 19 - 06122 Perugia (Perugia) Tel. +39 0755720841 - Fax +39 0755720841  Located in the heart of the city of Perugia (Piazza Italia) allows to fully enjoy the whole historic centre (distance 150 meter from Galleria Nazionale dell'Umbria) and to discover all the little secrets of a town which since centuries has been built for pedestrians.